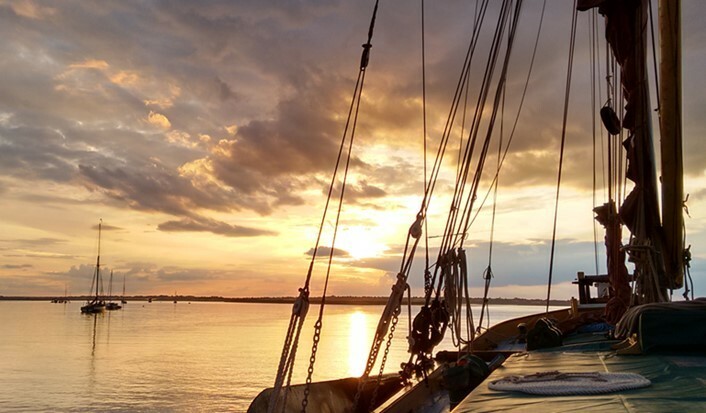 Now in the eighth year National Historic Ships UK’s Photo Competition is aimed at all photographers of all ages and dedicated to encouraging everyone to engage with historic vessels or maritime themes in their local area. With two new categories and some great prizes including an Overall Prize of £1000 to be awarded on a theme or activity involving an historic vessel. Submissions for our contest are accepted online from 1st April until 31st August 2017.
or by phone 020 8312 8558. It is with great sadness that The Friends of Raymond has learnt of the sudden passing of our Friend, Steve Tuckwell. Steve was a familiar face and supporter of FoR and he will be greatly missed by all of our Friends, Officers and Trustees. A service to celebrate his life will be held at All Saints Church, Braunston on Friday 21 April at 12 noon. All canal friends and colleagues are invited to join the service and then at The Admiral Nelson for light refreshments. Our deepest sympathy goes to Jan at this difficult time. Without your continued support the Trust would not be able to operate and Nutfield and Raymond could not be maintained. Our current Membership year ends on 5th April 2016 so if you are subscribed to our Friends email list you will receive a Renewal message shortly. 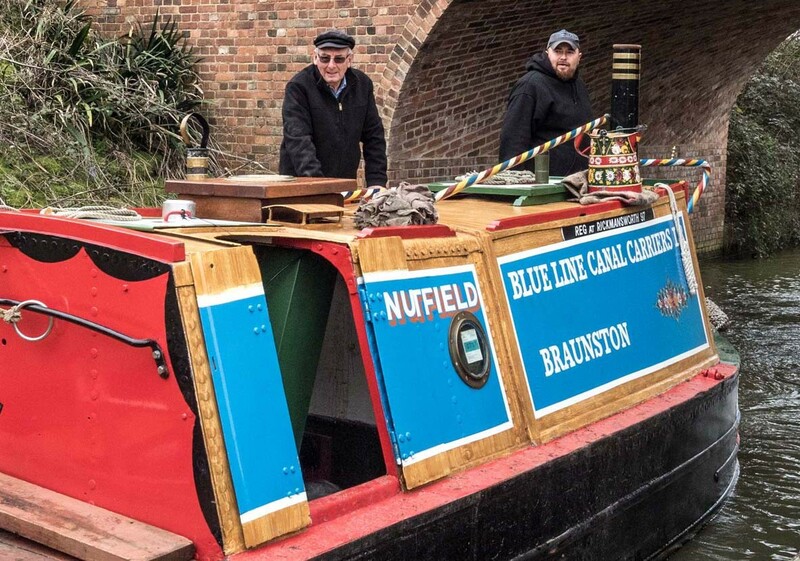 We are looking for volunteers to help with boat moving and event support at the three events following the Braunston Historic Show this weekend. 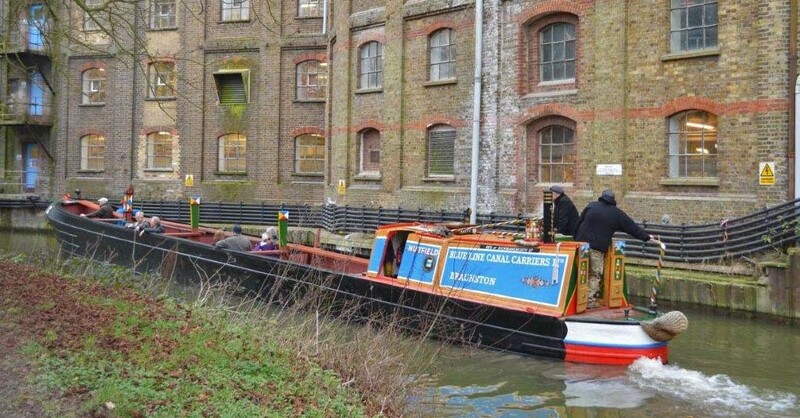 Saturday 2nd July depart from Braunston Marina at 2.00pm stopping at Weedon overnight and departing from there at 9.00am on Sunday 3rd July arriving at Blisworth at approx 12.30pm. Saturday 9th July or Sunday 10th July (day to be confirmed) depart from Blisworth at 9.00am arriving at Cosgrove 1.00pm – 2.00pm. Over the last 10 days our dedicated team has been busy giving Nutfield a brand new paint job. You will be able to see the stunning results at the Crick Boat Show, which starts on Saturday 28th May. Superb results from Huddlesford and Banbury! Huddlesford Heritage Gathering. We have taken £217.40 with £181.10 for sales and £36.30 for donations. At the Banbury Canal Day we took a total of £426..00 with £352.40 for sales and £73.60 for donations. This is a fantastic achievement for a one day event. We thought that we did extremely well last year on our first visit to Banbury when we took £331.91. Roger and Nick Lake were on the go constantly all day long doing the showrounds. Once again there were many people walking along the towpath past our boats. The previous highest amount of income raised in a year was in 2013 when our total was £3522.23. Our new record this year is £4185.96. The second record is in the number of Photo cards sold this year at over 400. Well Done Diana and many thanks for all your efforts in making these for us. 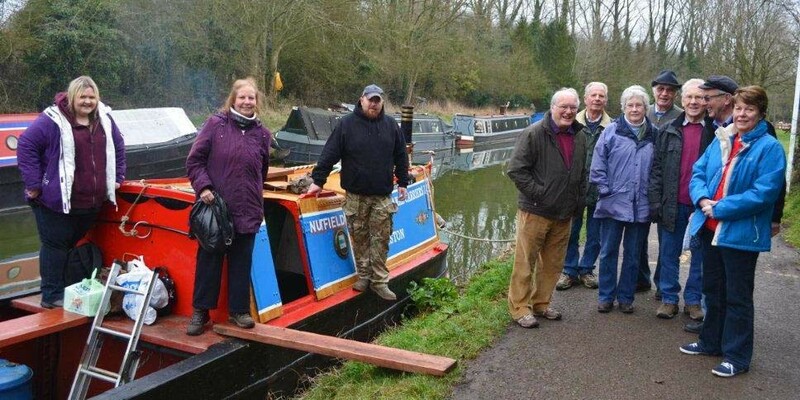 Many thanks also to all of you who came and helped as crew members and lock wheelers on our trip to Banbury and back. All of this has indeed been worthwhile. 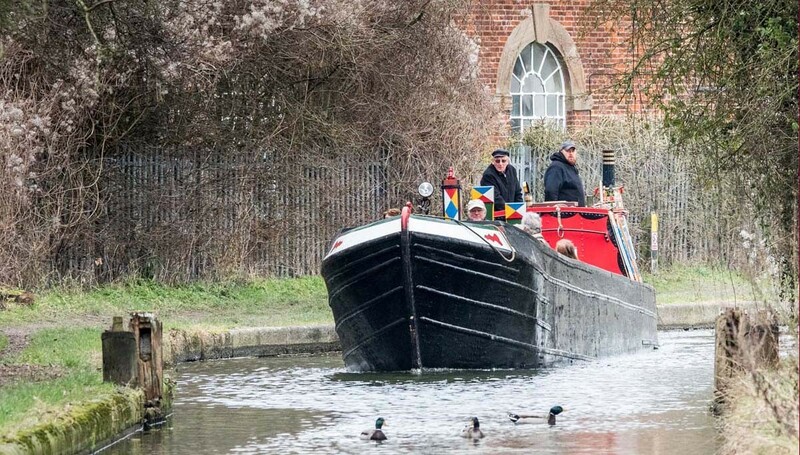 Sorry, but Raymond and Nutfield will not be attending the Black Country Boating Festival at Netherton over the weekend of 11th to 13th September. Saturday August 22nd saw the Friends of Raymond run our first ‘Member’s Day’. Luck was on our side – in this damp summer we actually had a fine day for our outing, instigated and organised by ‘the two Nicks’; Nick Lake, our new Treasurer, and Nick Scarcliffe, our Captain and Restoration Chief. This event had been planned at rather short notice, but even so a total of fifteen members and guests embarked after a quick introductory word from the chairman. 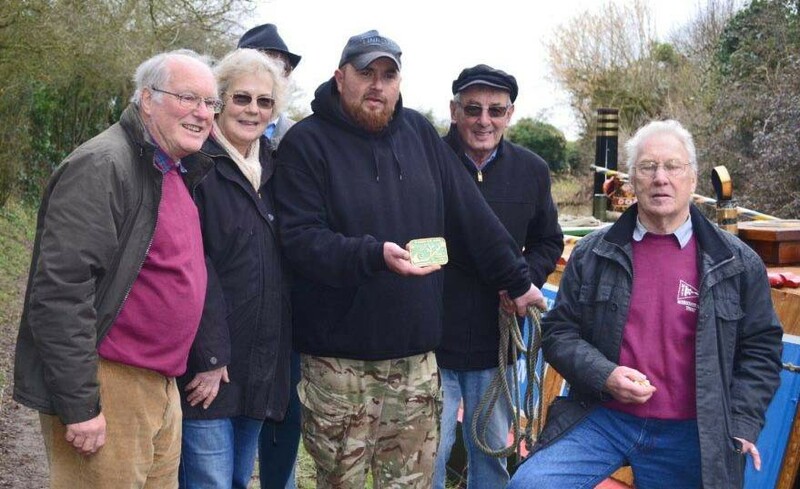 An easy trip from Braunston to Hillmorton, on the outskirts of Rugby, allowed a number of our guests to try their hands at steering the motor or butty; an exercise in winding at Kilsby Wharf and reversing up to the pub showed off Nick S’s talents, ably assisted by Trevor Maggs as supervisor and Ian Mulford and Tom Bonewell as bow-thrusters. The Old Royal Oak at Hillmorton Wharf looked after us all superbly, providing a private room for our lunch; both the food and service were excellent, and we were all feeling somewhat replete as we set off for the return journey. Back at Braunston about 4.30pm, the sun still shining, and people seemed reluctant to depart, standing on the towpath by the Stop House chatting – but eventually our guests drifted away, and the boats were returned to their mooring. It proved to be a very enjoyable day for all involved, the crew as much as the visitors, and plans are already afoot for a second similar day next year, maybe in the spring. This time we will give everyone more warning, and we will hope to see even more of our less active members come to enjoy the boats that they support so loyally.